Tonight, there’s going to be a Thanksgiving dinner at my Aunt’s….a house so far from ours, like 15 steps away, hee. Of course, I’m gonna be there even though today is the start of my not-so-serious-SBD-diet..– HAH! Surely, Thanksgiving is not really practiced here in the Philippines but it’s gonna be two years in a row that I’m thanking God for a bountiful year in November –why not? I do it everyday when I say my prayers at night. There will be no Turkey tonight because turkeys in this part of the world are expensive. But I heard there’s baby back ribs. Meanwhile, while I’m deep in Thanksgiving thoughts, I’ll just casually mention that I hope this simple, easy appetizer will make an appearance tonight before dinner…. Make this. You won’t regret it. I promise. Fry bacon slices in oil until cooked but not crispy. 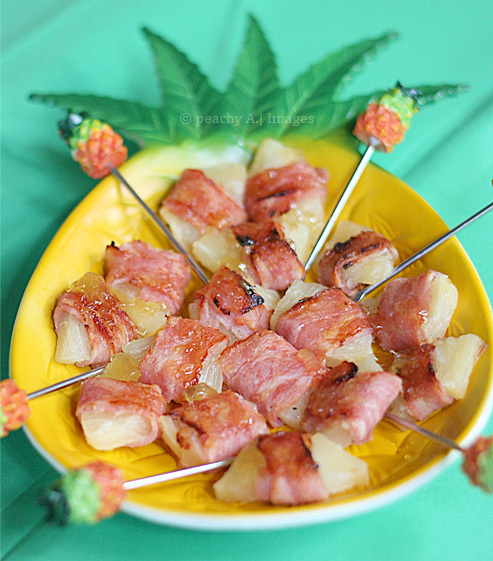 Wrap each bacon in a pineapple chunk and slather some pineapple marmalade. Pop into your mouth like peanuts…LOL! oooooooooooooo….I LOVE a good sweet & salty combo, and this one combines two of my very favorite ingredients! Thanks for sharing!! Salty, sweet, yum. Everybody loves this combination. OMG, now this would make me very happy! 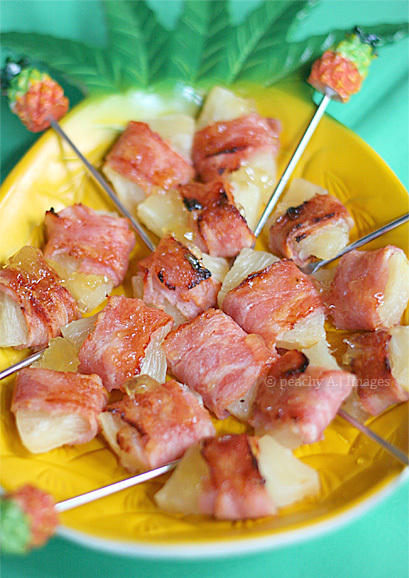 This is a great appetizer and just in time for the holidays. Hope you are having a great holiday week end. Thank you so much for sharing with Full Plate Thursday and hope you will come back soon!